Origin: South America. Middle and lower Amazon River, lower Tocantins River, Pará River, Trombetas River. Temperament: Timid. Do not keep with territorial fishes. Company: Other rays and non aggressive fishes. Aquarium setup: All freshwater stingrays including the mossaic stingray are cartilaginous fish, they lack gas bladders, and need to be in constant movement to be able to breathe. This means that they need a lot of open bottom space to swim on and a large aquarium to thrive. 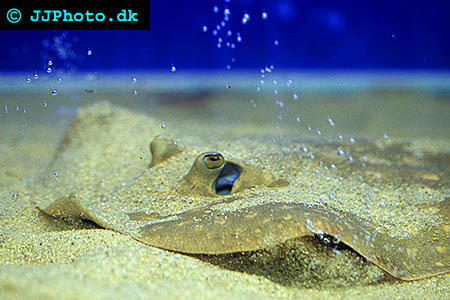 We don't recommend keeping mossaic rays in aquariums that are smaller than 100 gallon.. They are sensetive fish and good water quality with ammonia, nitrite, and nitrate levels close to zero is a must. This means that regular water changes and good filtration are very important. Avoid using hard decor as much as possible. They are sensitve to chemicals and you need to make sure that a chemical or medicine is ray safe before using it in a ray tank. Feeding: They can be trained to accept most live and froozen food. Avoid goldfish feeders. 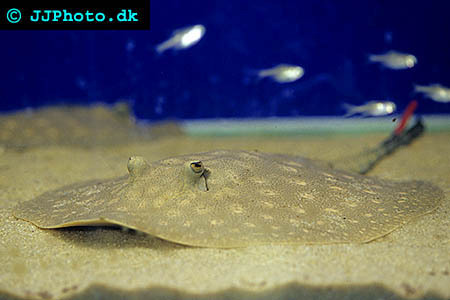 Breeding: Rays are hard to breed but are commonly bred around the world. They can be sexed by the modified pelvic found in males. The males use this fins as an aid when they fertalize a female. the females give birth to lfully developed fry called pups.